There are always new ideas and model building tips to try and clinics at model railroad conventions or train shows are great ways to learn about them. The following model building tips and ideas were presented at the Niagara Frontier Region (NFR) Saturday Night Express convention. I didn't have time to attend all the clinics, but the ones I managed to get to had some great ideas. Dave is a long-standing American member of the NFR (that has both Canadian and U.S. members). Dave comes from Rochester, New York, and has been been a member of the Rochester Club for over 50 years. I doubt there are many who have belonged to one club that long! I was writing quickly while taking notes so I hope I wrote down the information correctly. Dave recommends canopy glue for making windows. Canopy glue is a favourite of airplane modellers and can be found at hobby shops that cater to those hobbyists. This is a good reason to look at what other hobbyists use. (I even picked up a small sheet of 1/16" plywood to experiment with. (That idea came from Ron Newby's clinic on modelling with wood. See below). Canopy glue dries clear and transparent. It goes on whitish so you can what you're doing. Dave uses a microbrush or even a toothpick to put some canopy glue around the edge of the window opening first and then fills in the centre. This might not work in O scale but is a very good way of filling in windows in cabooses, engines or building windows in the smaller scales. It has other uses as well. Dave reviewed common glues and their uses. The main difference between white glue and yellow carpenter's glue is that the latter is waterproof. It is slow setting and very strong. Contact 3M Super 77 spray is good for mounting paper building sides and backdrop cutouts. Dave recommends DAP tub caulk or Kwik Seal as an adhesive. It provides a flexible, waterproof seal. I use caulk to mount motors in locomotives when I need to isolate them for DCC conversions and don't have a plastic screw to replace the metal one that secures the motor to the frame in older engines. Dave recommends Devcon adhesive and sealant (RTV silicon) to mount motors. RTV means room temperature vulcanizing. It has a slow set up time to allow you to position the parts. One of the other excellent uses for the caulk is to seal the edges of speaker enclosures. It can also be used for securing track to subroadbed. It has to be weighted for this application because it is slow drying. I don't like to use it for track because it is difficult to lift the track and turnouts without destroying them. Dave also uses DAP caulk to mount Tortoise switch machines to get them into the right position. He advises counting to 60 seconds to get a temporary bond. As a cheaper alternative to glues like Testor's or Tenax, you can use MEK (methyl-ethyl-ketone). It works half as fast as Testors to set up. It has very toxic fumes so you need to wear a proper respirator. If possible, use it outside or in a well-ventilated area. (It's another substance with toxic fumes). Use it for projects like mounting backdrop paper. Coat both surfaces and let dry until it is tacky. Slip a piece of waxed paper between the surfaces to be joined. Position carefully because you'll get an instant bond. 3M artist's spray can also be used for temporary bonding. Dave also uses paper cement to put on paper shingles to roofs. For AC glue (so-called super glues) for joining just about anything, Dave likes the BSI adhesives. BSI (Bob Smith Industries) Instaset can be applied with a microbrush or as a spray. It will lock together parts instantly. The Super Thin sets up in 15-30 seconds. Good for handrails. The Medium takes 30-60 seconds. The glue takes 24 hours to reach maximum strength. Use BSI Uncure to break the glue joints. Dave uses their adhesive to seat locomotive bulbs. If the bulb burns out the Uncure can be used to release the bulb. Dave keeps the glue bottle in a sealed container with a little silica gel to keep moisture out. Duro Quick Gel is good for vertical surfaces. Another adhesive worth knowing about is M-S Epoxy 907. It is good for repairing broken parts like old locomotive frames. Needs clamping. Parts must be held together while the epoxy cures. Poly Zap is good for engineering, slippery plastics like Delrin. Micro Engineering now has adhesives for these plastics. Other model building tips cover the installation of window "glass". Dave uses Scotch tape across the back of the window opening to support the glue. He uses Super Z RC-56. He puts it on as a glob around the window opening on the backside and presses the window plastic into it, clamping it in position with foam pads to hold the "glass" in place. The adhesive dries transparent. An alternative is Micro Crystal Clear. Put it around the window edge and then spread a glob across the opening. Use a sewing needle to apply CA glue. Put a small puddle on a coffee tin lid. Dave uses a Dremel stone to flatten the end of the needle into a "U" shape to make it easy to pick up a drop of CA. (I have been using dressmaker straight pins). Finally, here's Dave recipe for ballasting track and securing scenery: Elmer's white glue and water in a ration of 1:3 with 1 drop of detergent per cup (8 ounces). Dave did a second clinic on airbrushing. Here are some recipes for spraying. Polly Scale Flat: 75/25 mixture of paint to thinner. 20-30 psi. Harder to spray. Tamiya: 66/34 mixture paint to thinner. Floquil Flat: 75/25 mixture paint to thinner. 12-20 psi. Scalecoat Gloss: 75/25 mixture paint to thinner. 15-20 psi. Always use the manufacturer's recommended thinner. If water is the thinner, use distilled water to avoid impurities. Polly Scale on plastic: apply Poly S prep liberally with a brush before spraying. Allow to dry. Floquil paints have been discontinued but many modellers, including me, still have some lying around. Other things worth knowing. Scalecoat One is an acrylic version of their paint. 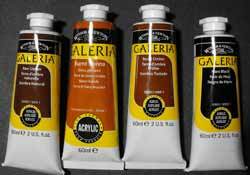 Acrylic paints are not volatile or toxic but you should still avoid breathing the fumes. Get in the habit of always using a mask. With acrylic paints you can get away with using a simple dust mask. You should always use a respirator with solvent-based paints. Spray outside if you can't vent the fumes from your spray booth. When getting ready to spray, mix paint and thinner thoroughly. Transfer the amount of paint required to a separate bottle using a plastic pipette or eye dropper before adding the thinner. Some thinners for acrylic paints are water-based or a water/alcohol mixture. Use what's recommended. You can use a mixture of 1 part Windex to 9 parts water to clean dried airbrush and tip when using acrylic paints. Acetone or lacquer thinner can be used to clean airbrushes after using solvent-based paints. Use a microbrush or Q-tip to clean the tip. NEVER stick a pipe cleaner into the tip. (Bad habit of mine). Use vaseline on screw tops and airbrush threads to lock out air. Needle sizes. #1 is the smallest. use for weathering control. Thin paint more. 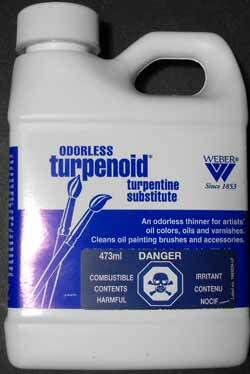 As a substitute for turpentine if you use artists' oil colour paints, consider using turpenoid. It's odourless. #3 is medium and use for general work in HO and N scale. There's a lot more information about airbrushing on my airbrushing page. Ron Newby's clinic had some good model building tips. Here's his recipe for staining strip wood for ties and buildings. Put the strip wood pieces in a plastic freezer bag with the stain. Remove groups of boards at different times to get varied shading. Mix them up when building. Stripwood and siding can be wiped with stain and/or dunked. It was Ron's clinic that gave me the idea of buying some thin plywood at a hobby shop catering to model airplane enthusiasts. Ron recommends using tacky glue to give time for positioning the wood pieces. I bought some at Michael's. 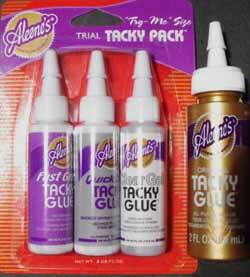 This glue is available in many crafts stores. He also recommended using artist pens (Prismacolor and Letraset) for colouring wood and caligraphy inks for a range of colours. Another interesting idea is to use an antiquing solution. I got mine during the same trip to Michael's. Ron doesn't usually add nail holes because you can't see them from any distance. However, he recommends the nail-holer from Monster Model Works if you want to add them. Brian Buss did the scenery clinic. He recommended a product i have never used: Woodland Scenics track pads. He put on a demonstration of building scenery instead of just talking about it or using a Powerpoint presentation. The pads under the track looked really good after he did the ballasting. He used a 3:1 water/alcohol mixture in a spray bottle to wet the scenery base (no dishwasher detergent) and followed up with a 50/50 mixture of white glue and water. I have usually used matte medium for this step, but it's a matter of preference. Brian doesn't like using detergent because he finds it leaves a scent. He also uses white glue to hold together slabs of styrofoam instead of caulk and he prefers using Poly filla instead of other plasters. He puts used dryer sheets on the styrofoam under the Poly filla. As for the scenery cover, he starts with the finer materials and adds coarser material on top finishing off with Woodland Scenics clump foliage and the like. For the finer material he folds a sheet of paper in half, fils it with some material and then blows the material onto the scenery base. This works well for vertical surfaces. Brian uses rubber cement to add foliage to tree armatures or 3M spray adhesive. Backdrops: Brian recommends a backdrop should be as high as the layout is wide (assuming a perimeter-type or shelf layout). Buy styrene sheet from a plastics shop. They often have scraps or damaged 4 by 8 foot pieces. Another source is plastic election lawn signs. He used a wide brush to paint on two shades of latex blue (a very light and a medium blue) with the lighter one at the bottom. He used a wide brush to go back and forth to blend the two blues while they were still wet. Add water if necessary to thin paint and keep it wet during this step. His technique for clouds is to dry brush them with a stiff brush, big clouds at the top and smaller clouds towards the (lower) horizon. He used two colours: a bright white and a gray. The gray is for the bottom shadows on the clouds. It is important not to drag the brush across the backdrop. The technique is to push the brush bristles with a dabbing motion and to work in circles. Note that the bottom of clouds are typically flat. Keep in mind the sun's direction. His final trick was to use sculted ceiling tile against the backdrop to add depth to the scene with a mountain. Very effective. There's more about backdrops on my backdrop painting page. Dave Smith, a member of our group that goes to Trainfest for Craftsman's Corner, did a clinic on "modelling with garbage". At Trainfest Dave has been doing a clinic on making all kinds of different trees. I had never seen his "garbage special". He used everything from bird houses to those wooden boxes you can buy wine in at Christmas. He recommends narrowing your interest to a specific time in a specific year. For example, if it's Sunday then you build a church scene. If it's Wednesday there's a wedding in the church. This helps to keep you focused and your hands in your pockets at the hobby store. He also recommends spending your money on track first and noted "one good engine is better than ten poor running ones". Good advice. He showed a number of cheap ways of filling up empty spaces with throwaway materials and is a big believer in mockups. He photocopies building sides and uses colour photocopies of building papers as a cheap source. One of his best model building tips was to dunk the coloured paper in Thompson's Water Seal. This makes the paper waterproof so the inks won't run. It also helps to cut down on warpage. He uses cereal box cardboard, shirt cardboard and anything else at hand. Dave showed examples of 1" rigid foam on the backdrop with building paper on front. Making a roof steeper with aluminum foil, for example, makes the backdrop building look like it has more depth. Dave used ground up tea leaves (after drinking the tea) and sawdust dyed with Rit fabric dyes as a scenery base. He collects roots from the garden to turn into trees. Other buildings were made from plastic pipe and toilet paper rolls. Imagineering at its best, and cheapest! As an aside, Tim Warris, owner of Fast Tracks, explained a fascinating method of putting faded signs on buildings using photography and a computer in a posting in the Model Railroad Hobbyist magazine's forum in April, 2012. It can be found at node 7716. Model Railroad Hobbyist is a free magazine on the Internet loaded with content and the forums are a terrific source for information. I hope these tips help you. Next time there's a convention, don't miss the clinics. There is always something new to learn.